This avatar will be a reminder of my ultimate goal. I'm gonna need a classic reaction to this one. You win this time, Deja Vu, I couldn't get home in time to get that avatar. Then again I got dibs on Crystal Dragon yesterday, heh. 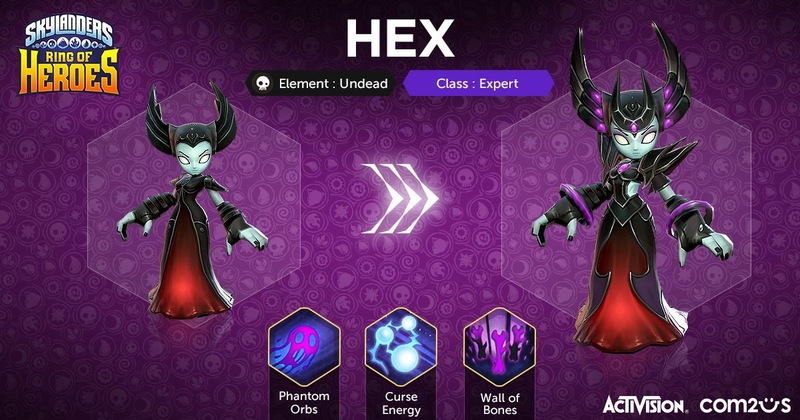 Wow, Hex is my favourite so far. I like how her dress is red just like her lightcore figure. Hex is cursed I tell you, CURSED!!! There's no need to post this much on a slow forum. Seems like new posters are put up every other day, so probably we'll see the rest of the elements+ light and dark before any repeats. If Hex is the first Undead rep, I wonder if Earth will have Flashwing, since Academy and Imaginators ditched Terrafin altogether. I'm hoping for Sprocket as the Tech rep since she's considered a "main character" in Academy. Sprocket would be sick !!! If they add Superchargers, would they implement vehicles into the game? I don’t think so battlecast ignored them. Battlecast used them as cards. I doubt it, if we do see vehicles I feel they'll be implemented in the story similar to how they feature in Skylanders: Academy. Also, for future reference, please use the 'edit' button to extend your post rather than double post. Thank you! I like it but I've always preferred Terrafin's original design as oppose to the SuperChargers design. Probably my least favourite yet but I still like it regardless. ...Huh, so some will be Superchargers AND Awakened. Interesting. Thankfully they went the regular way with SE because I still think her SC form looks horrid. It's nice that everyone has an opinion, isn't it! Yeah, maybe let him have it then instead of being mean about it. I just noticed that Slam Support is an actual attack from the console game. I was thinking about the name for the longest time wondering why he has a Support attack. Terrafin looks really good although he doesn’t look that different but still...I’m betting that Roller Brawl and one other core will be getting the same treatment. I would've preferred his original design, since I think that could have a much cooler awakened form, but I still like it. Also... does this mean Superchargers can get awakened? I expected terrafin to be there but i did not expected his supercharger form. Its look nice but i would rather have the original form. Who knows, if sky7 would have happend then those awekend form could be the gimmik. 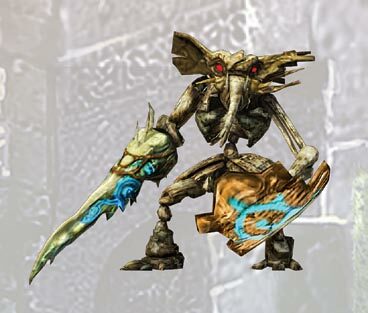 I’m expecting every skylanders to appear on this game to get an awakend form including the Gimmick-landers. It will be cool to see what they will do to Spitfire and Kryptking. How do you know Krypt King is included? Wait, we know that Stormblade and Crusher are in this game, so... 2 per element? It could be as many as the entire cast, but I doubt we'll see everyone with counterparts. Might be just 3 for element like Battlecast, though, which would mean Pop, Spyro and Ninjini again. Not much on the way of popular Magic guys and Pain-Yatta is probably an enemy. do you think they wil add the light and dark elements? The 2.5D art style similar to Rayman Origins or Child of Light is absolutely a most brilliant choice. do you even know what 2.5D means. Not what I was expecting but he doesn't look that bad. LOVE IT! And this confirms what we already knew, more than one Skylander per element. What does this mean for Spyro? Basing off of this image, we know he's in the game, so he's good. We know he's in the game, so he's good. Uf there is another, who do you want? As Bifrost said, we will probably have the Battlecast team for Magic with Ninjini. Though I would like to see a new version of her. Spyro, Gill Grunt, Hotdog, Riptide and Spitfire. Magic: Pop Fizz, Spyro, and Ninjini. Undead: Hex, Cynder, and Krypt King. Roller Brawl is a possibility. Air: Jet-Vac, Stormblade, and Whrilwind. Note: Before Battlecast closed down Sonic Boom was supposed to join the game. This is looking pretty promising. Do we know if toys/cards are involved in this yet? Even if they aren't, still sounds like it could be a fun addition to the mobile series. Pop fizz looks crazier then usual, i Like it. Pop Fizz with clothes looks pretty good, though I was expecting something more elaborate like the rest. Hex: Best one so far. Wins all my coins. 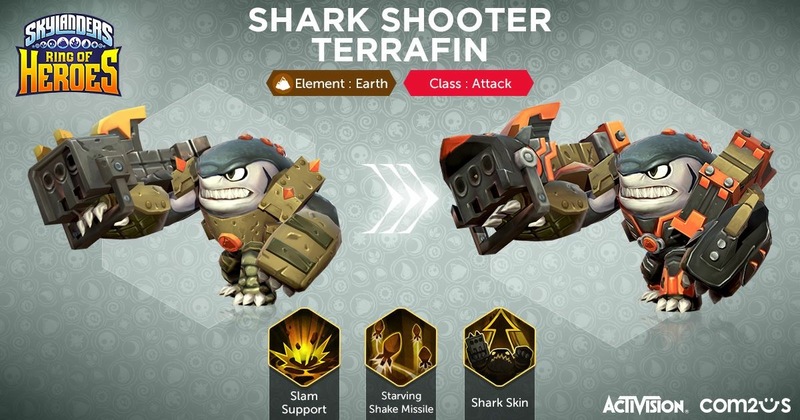 Shark Shooter Terrafin: OKA- I love the Construction-look. Looks real nice. Now if we're getting Awakened Superchargers... give me Splat and Nightfall or give me death. Pop Fizz: Best version of Pop Fizz yet. He looks so nice omg. Tech next with Sprocket is all I ask please.